Hakusan, Japan, December 6, 2016 – EIZO Corporation (TSE: 6737) announced that it has received approval for its 19 and 25.5-inch maritime monitors for electronic chart display information systems (ECDIS) from DNV GL. The approved monitors are DuraVision FDS1904, FDS1904T, FDU2603W, and FDU2603WT. DNV GL (Norway) is the world’s largest international classification society which provides classification and technical advisory to the maritime industry. DNV GL sets standards for ships and offshore structures to ensure safety and high performance of installed equipment, including ECDIS. ECDIS is a digital geographic information system which complies with International Maritime Organization (IMO) regulations and can be used as an alternative to paper nautical charts. The DuraVision FDS1904, FDS1904T, FDU2603W, and FDU2603WT comply with international standards IEC60945, IEC61174, and IEC62288 to ensure resistance to high temperatures and vibration and meet color and screen characteristic standards for displaying electronic charts. ECDIS will become mandatory for new and existing ships engaged on international voyages by 2018. 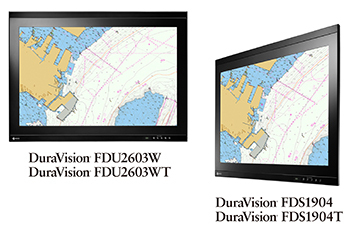 The DuraVision FDS1904 and FDU2603W are 19 and 25.5-inch marine monitors with 1280 x 1024 and 1920 x 1200 resolution respectively. DuraVision FDS1904T and FDU2603WT are the touch panel variations with projected capacitive touch technology. With ECDIS compliance, EIZO continues to provide a high degree of customer assurance to maritime industry professionals. EIZO (TSE:6737), which means image in Japanese, is a visual technology company that develops and manufactures high-end display solutions. EIZO integrates hardware and software technologies with consulting, web hosting, and other services to help customers in business, graphics, gaming, medicine, maritime, air traffic control, and other fields work more comfortable, efficiently, and creatively. Headquartered in Hakusan, Japan, EIZO has R&D and manufacturing facilities in Japan, China, Germany, and the US, and representation in more than 80 countries.